Is this something you are interested in? Please provide your use case and details on this topic and vote up if it is important. I would be interested in this, my scenario would be: all my visitors to one of my websites all give a unique header because they are coming from a set top box, to have the ability to allow my legitimate traffic from the set top box only and disallow all other traffic by page rules would be great also would be another security feature for my website! If particular bad user-agent matches, do DNS error. 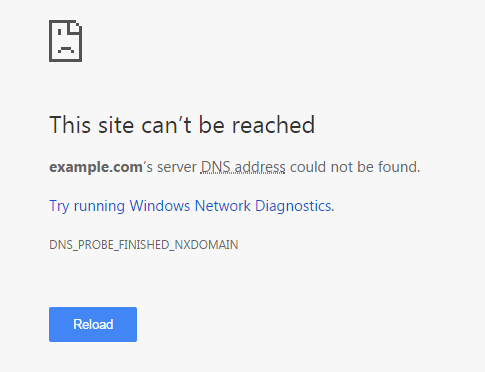 @GulshanKumar you want to return a page that looks like the DNS error? That’s actually pretty creative and funny. Not sure bots would get the humor but it could certainly mess with scraping applications. I’ll pass it along. I want like this. Assuming that, making cluless is better than giving hint of a specific error. Yes, I am interested in the HTTP referer header. Example: if (HTTP referer contains “something”) perform a 302 redirect. Is there any update on User-agent sniffing feature? I want to bypass cache for a evil bot. I want this because I am facing a real problem due to HIT response CACHE. Force https, avoid redirect chain, excluding robots.txt path and evil bot. Unfortunately, above rules based on user-agent doesn’t work as long I use Cache Everything page rule. I can bypass cache for few path. But really, that’s not a complete solution. I think here user-agent sniffing should work from Cloudflare page rule side, then only I can get a perfect solution. This feature will be very useful. @ryan are you still considering implementing the “rules by headers”? We are very interested in this feature. This sounds like it might be great for pages that display different content based on user-agent. Anything to make the user-agent detection faster! I would like to see this feature. Use case: externaldomain.com that I don’t control is redirecting to my domain. I want a visitor with a referrer of externaldomain.com to go a specific page within my website. If I can’t do this in the page rules, I am stuck doing it in my CMS, and if I cache all my HTML, I am stuck doing it on the front-end, which isn’t ideal. This would be great, I wanted to display different contents for users who embed my webpage but there was not way to do when cache everything is on. So I had to use “x-frame-options: den” header rule that was not wanted as I wanted different contents. So a page rule based on page referrer will be awesome. Interested in this also. Would love to be able to create page rules based on more than just URL. Page rule on useragent (google/Bing) to route their traffic and other crawlers/scrapers/etc to a specific set of servers and allow my live (human traffic) to production servers. Google/Bing crawls account for 60% of my traffic on the sites I host. Having them on an identical platform (just not production) would greatly increase my response time for real humans on my site. I’d like to be able to turn off caching when a specific header (or a specific header value) is present. For example, we want to provide public access to our APIs. We’d like to provide users with the same URL we use in our apps. The difference is in our apps we want to cache the response at the edge, however when we know it’s a public user, we want those requests to hit our server so we can count it towards their API request limit.